This month's case study features the delightful Puddleduck Nursery which is situated in Howbery Park, 70 acres of beautiful landscape, in Oxfordshire's Crowmarsh Gifford. Sarah Hayden from the nursery phoned to tell Malcolm, one of our trainers, that her Paediatric First Aid training was recently put to good use. One of her charges was acting oddly whilst asleep and so Sarah picked him up and took him into another room. This two year old boy started convulsing and his eyes were rolling. She placed him carefully on the soft floor and timed his fit which lasted for about a minute. Meanwhile, her colleague rang for an ambulance and then rang the boy's parents to arrange to meet them at the John Radcliffe Hospital. After a minute, the boy started crying and Sarah was able to comfort and reassure him whilst they travelled to the hospital. It turns out that the child had experienced a febrile seizure, which is a fit that often occurs when a child has a fever, or from overheating as small children are unable to regulate their temperature efficiently. Although it is a relatively common childhood condition, it can be very frightening and distressing to observe but as Sarah and her team have been regularly trained at OCFA, she didn't panic and she knew exactly what to do. Would you know what to do? 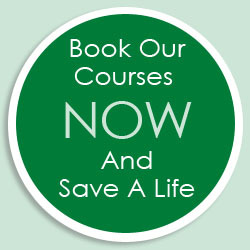 If not, we still have three spaces available on our Paediatric First Aid course on Monday June 30. Jim, Hattie and Iain have all said that the course was enjoyable and informative. All are confident enough to act as emergency first aiders too - so I think it was a success from our point of view. Did you hear OCFA on Radio Oxford a few weeks ago? One of our trainers, Dian Slay, was invited on Radio Oxford's Kat Ormond Show and she gave a very interesting interview including discussing an incident where she was able to help someone on Australia's Bondi Beach. She also posed an important and searching question: "Would you know what to do if your child fell off a climbing frame?" However, our favourite part of the interview is where she mentions being stopped in Tesco's by a recent delegate from one of her courses who informed her that he had SAVED TWO LIVES since attending her course! He had helped a family member during a heart attack AND resuscitated a child, who was drowning in a swimming pool! And that, in a nutshell, is why we love what we do for a living! To book on a course, please contact us at info@ocfa.co.uk or call us on 01235 810619. Hope you enjoyed the fabulous weather at the weekend. So, in this month's Hints and Tips, we are looking at Sunburn! Sunburn can be prevented by staying in the shade, wearing protective clothing and by regularly applying high factor sunscreen. Most sunburn is superficial and can be treated by covering the affected area with light clothing or a towel or, preferably, move indoors. Have frequent sips of cold water, dab the area with cold water or soak the affected skin in a bath for ten minutes. For mild sunburn, calamine or an after-sun lotion may soothe the burning sensations. For severe sunburn always seek medical advice. "Who Is The Current Wimbledon Men's Singles Champion?" Email your answer and contact details to Jane at: info@ocfa.co.uk and we'll draw one winner from the correct answers on Friday 27th June 2014.